In 1998, Dale Earnhardt carried another special paint scheme on his No. 3 GM Goodwrench Service Plus Chevrolet for The Winston. This made the fourth consecutive year that the team ran a special paint job for the non-points event at Charlotte Motor Speedway. 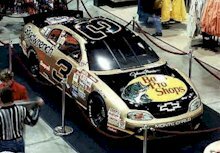 For '98 it was a unique black and gold paint scheme with a "Bass Pro Shops" logo on the hood of the Richard Childress Racing Chevrolet. "The NASCAR fan and the outdoor enthusiast are one and the same," said Bill Fitzgerald, manager of sports marketing for General Motors Service Parts Operation. "We are excited to have Bass Pro Shops on our team and look forward to being a part of the salute to the American outdoorsman." 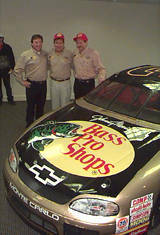 Bass Pro Shops and Tracker Boats joined Childress Racing as an associate sponsor at the beginning of the 1998 season. Earnhardt's cars carried their logos on their "B" pillars, with the exception of the special display for The Winston. "I'm always asked, if I wasn't driving a race car, what would I do?" said Earnhardt, who won The Winston in 1987, 1990 and 1993. "My answer would be something involved with the outdoors. When I get away from the race track, I usually head to the woods or the nearest lake. It's my way to relax and get away from the phones." "When they came to me and asked about carrying the Bass Pro Shops logo for The Winston, I thought it was a tremendous idea." Dale Earnhardt, a three-time winner of The Winston, was involved in a three-car accident in the early stages of Saturday's event. The mishap occurred on the ninth lap of the first 30-lap segment. Darrell Waltrip's No. 1 Pennzoil Chevrolet, owned by Earnhardt, blew an engine and put down oil going into turn one. Earnhardt and John Andretti, who were immediately behind Waltrip, slipped in the oil and spun out. The driver's side of Dale's car slammed hard into the outside wall before sliding to the bottom of the track where it came to a rest. After the accident, Earnhardt walked the short distance from the infield care center to an ambulance with his jumpsuit around his waist, revealing a bare chest. At 9:56 p.m., the ambulance pulled away toward University Medical Center, lights flashing. "It could have broken Dale's ribs," said Richard Childress, owner of the No. 3 Chevrolet, which sported a gold color Saturday for a special Bass Pro Shop sponsorship. "He had a lot of pain in his chest." "I've made way too many visits to the hospital this year. He's real sore. It's a tough deal. It's one of those deals. I guess the (No.) 1 car blew up and we happened to be in the wrong place." At the University Medical Center, he was checked out and X-rayed. After discovering he was OK, Earnhardt left for his home in Kannapolis, N.C., via his private helicopter. Earnhardt, who had to start at the back of the field because he overshot his pit stall in Friday's qualifying, had already spun once, in Turn 4, before the crash that ended his night. Waltrip's crew apparently pushed his engine past its limit for the short 70-lap event, causing it to expire before the event's first segment was even over. "I told them [his crew] to build me a motor like the one I won with here in 1985," Waltrip said, recalling his only victory in The Winston. In that race, his engine blew as he took the checkered flag. "I forgot to tell them I had to run the whole race," he said. Asked about wrecking Earnhardt, his car owner, Waltrip joked: "Yeah, he's not going to be happy about this. I think I'll change clothes and go home." Earnhardt returned to action the next week for the Coca-Cola 600. The sleek black and gold car on display. Earnhardt leans on his gold machine. Earnhardt spins in turn 4 but avoids serious damage. 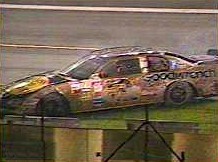 Soon after his first spin, Earnhardt and John Andretti slip in oil, resulting in a bad two-car wreck. Earnhardt's battered Chevy sits on the infield grass. A diecast version of the car.